More than two dozen kids attend learn-to-play clinic Sunday at Camden National Bank Ice Vault. HALLOWELL — Her head down, her arms pumping, the sound of skate blades tearing across the ice, Xandra Malinowski drove to the net, collected a pass from her brother in the slot area and floated a shot inside the left post. Derek Malinowski, who finished off his senior season with the Gardiner Area High School varsity hockey team in February, raised his arms above his head and crashed into the boards in celebration. “I just wanted to embarrass her a little bit,” Derek said with a smile. He wasn’t the only one smiling widely on Sunday morning at the Camden National Bank Ice Vault. 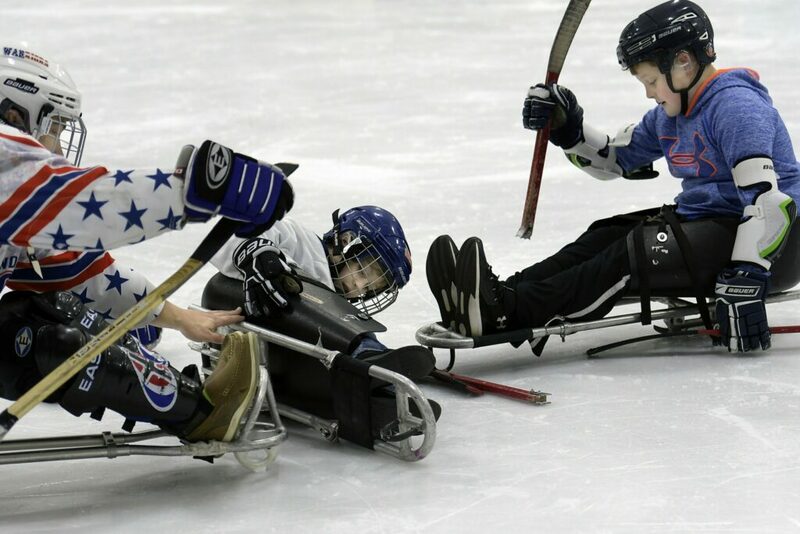 More than two dozen children and young adults covered the ice sheet as part of a learn-to-play sled hockey clinic, held in partnership between USA Hockey and the New England Warriors sled hockey team based in Lewiston. Families came from as far away as Caribou in an effort to give their kids the chance to try the game. For 15-year-old Xandra Malinowski, it was a chance to try a game she’s grown up following. Diagnosed with cerebral palsy by the time she was 18 months old, she’s been to virtually every single one of her older brother’s hockey games over the last decade-plus. Her mother, Becky McLaughlin, noted that for years the family wondered if an avenue would ever arrive which would allow Xandra a route into the sport she was so fond of. And then they heard about Sunday’s clinic. It was the first time she’d ever attempted to play hockey, the first time she’d ever received a pass from her brother on skates. 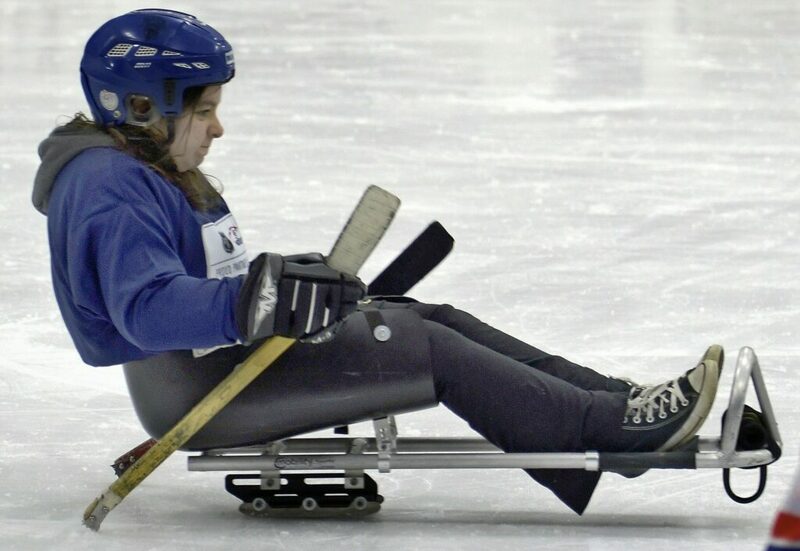 Sled hockey utilizes a bucket seat over a pair of skate blades as the vehicle, and players use a pair of modified sticks to push themselves along the ice and play the puck. For Sunday’s clinic, USA Hockey shipped in 11 sleds from its headquarters in Colorado. Helmets, elbow pads and other equipment were provided locally. For players like Kanah Kull, 20, of Brunswick, the game looks almost effortless. Kull can generate plenty of speed, turn and maneuver deftly, and shoot and pass the puck as well as any traditional hockey players. 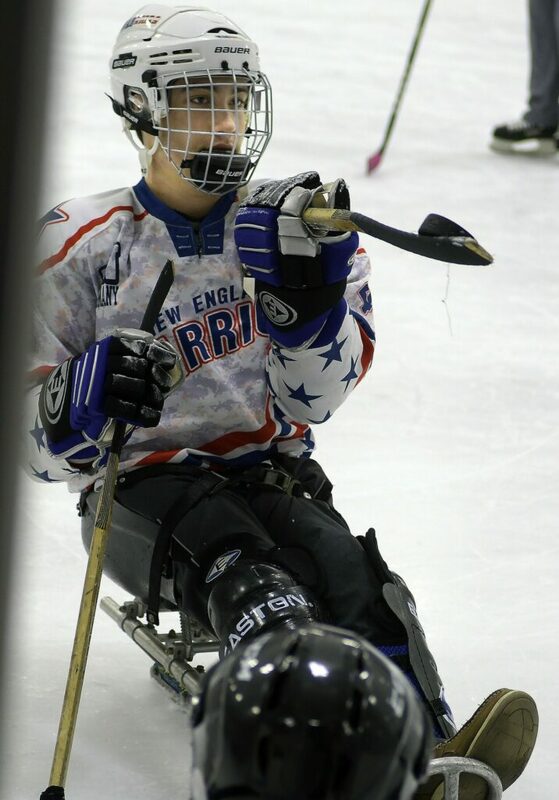 His entry into the game, where he now plays for the New England Warriors, came as a child, where he first participated in adaptive downhill skiing at Sunday River. He was thrilled to see young children getting their first taste of sled hockey, which he wasn’t introduced to until he was a teenager. “I think this is great,” said Kull, who has spina bifida. “I never got to play in a youth division, but I think this shows that there’s interest in that. Deb McSweeney of the Skating Association of Maine (SAM) is a pediatric therapist by trade. She works daily with young children battling disabilities and sees a need for more outlets for those kids to participate in sports. 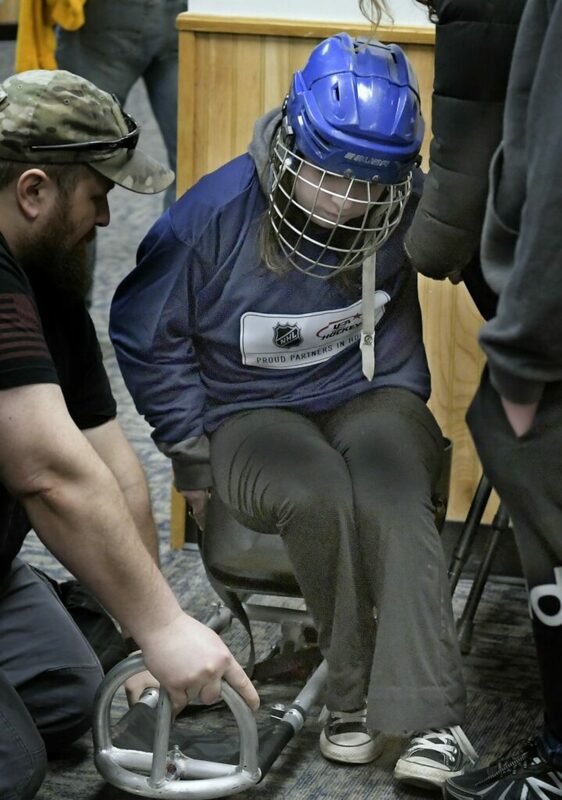 Sunday’s clinic was a step in the right direction, she said, and a barometer for the enthusiasm which exists in the community for sled hockey. The Malinowskis weren’t interested in a competitive experience, or even signing up for New England Warriors tryouts. At least not yet. For Derek, it was worth every minute of the wait.